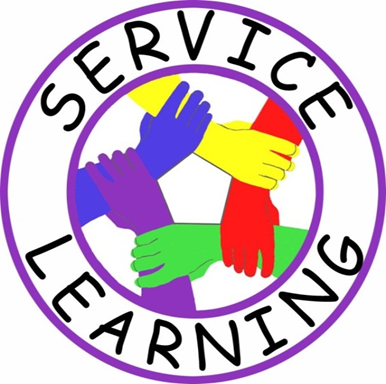 Service-Learning (SL) is a method under which students or participants apply and develop what they have learnt in school through active participation in thoughtfully organized service that is conducted to meet certain needs of a community. In other words, in Service Learning, participants not only learn the practical applications of their studies, they also actively contribute to their community. Where is it in Vietnam? 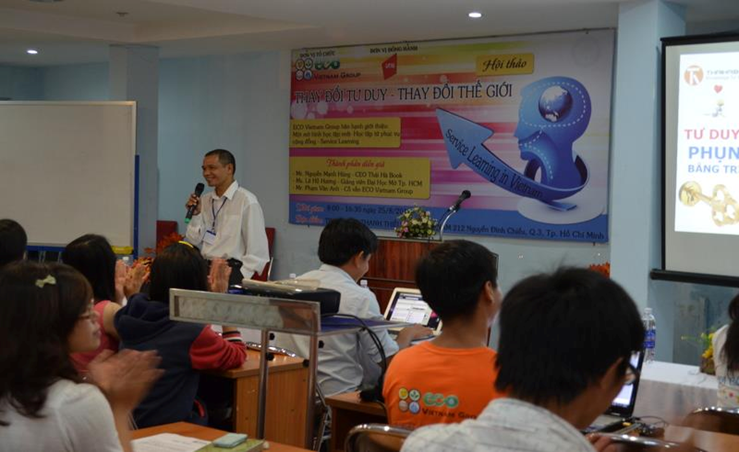 The motto of education in Vietnam emphasizes “Study must be accompanied by practice” as a guideline for all education activities .However, as the matter of fact; Vietnamese universities’ programs are still limited in the application of theory into practice. Consequently, graduate students often do not meet the actual needs of the society; their lack of practical skills becomes their barriers to further success. On the other hand, there is very few social or educational researches mention about education on community responsibility for Vietnamese students. Meanwhile, in many schools and universities’ programs around the world, both education on civic consciousness- community services and the application of theory in real life are compulsory to students. In fact, they combine these two concepts to one method called: Service Learning. Since the 1960s, SL has been applied in many universities around the world, in the United States has more than 1,000 universities and colleges that apply this method to more than 6 million students .For years, SL has proven itself as a sufficient strategy for sustainable development in a country. Service Learning nowadays is a common study method in America, Europe and Australia; it is spreading in Asian starts with Singapore since more than 10 years ago and recently in Vietnam since 2009. Service Learning is usually mistaken with soft skills courses or volunteer works where they either focus only Service or Learning. It is a misconception that can only be clarified once you actually involve in a real Service Learning Program. Research shows that students learn by doing. Unlike those soft skill and life skill courses, Service Learning projects/courses are designed strongly close to real life. Some of the skills that can be developed through Service Learning are management skills, communication skills, team-works skills, etc. While some of these skills can be taught in a classroom or a course through class activities and team projects, they will not have as much of a long term effect, because through Service Learning there is a more personal and hands-on experiences. Reflection is the most important process in Service Learning, where participant are becoming aware of what they are studying, they explore and link their experiences to their academic knowledge for self-criticism and learn from it. This is the Big L in Service Learning: acquiring and constructing knowledge. Moreover, Service Learning projects are usually organized in needy places so the participants must solve the unexpected, inconvenient condition. Through Service Learning projects, they instill their civil responsibility and serve their community’s needs. This is the Big S in Service Learning: Serve disadvantaged community. The outcome of a good Service Learning program is Big S together with Big L for both the students and the community that they come to serve. Since establishment in 2009, EVG has embraced the values of service learning in all of our projects, EVG is the first non-governmental organization (NGO) that introduced this method in Ho Chi Minh City. We believe that every community service has to be accompanied by learning about the community’s needs and implementing our talents to further enhancement of future services. Many young people in Ho Chi Minh served the community for wrong motivations, such as a good resume or simply looking for interesting activities. EVG aims to change their mind-sets by imparting an understanding of the benefits of Service Learning Projects for their personal development and the community as well. With the never-ending supports from counterparts in Singapore, EVG has managed to slowly, but surely; bring the concept of Service Learning to other NGOs, clubs, and some universities in Ho Chi Minh City, Vietnam. EVG organized the very first conference about Service Learning on June 2011. The theme for this conference is “What are community service and youths’ roles responsibilities in it?”. Based on this theme, EVG invited many representatives from various clubs and NGOs in Ho Chi Minh City to share their Service Learning: A method under which students or participants learn and develop through active participation in thoughtfully organized service that is conducted in and meets the needs of a community. Sustained by nature, sustained by talent stories in serving the community and how they have learnt from those experiences. Also, EVG invited some students and teachers from Singapore to share about how Service Learning Project is strongly enforced in Singapore education system and how it has benefited the participants tremendously. The first Youth For Causes opened up door of opportunities for these young leaders to build connections and better understand the values of service they are doing. After introducing the concept of Service Learning (SL), EVG desires to deepen the understanding of young Vietnamese on how to apply this concept into various community projects. 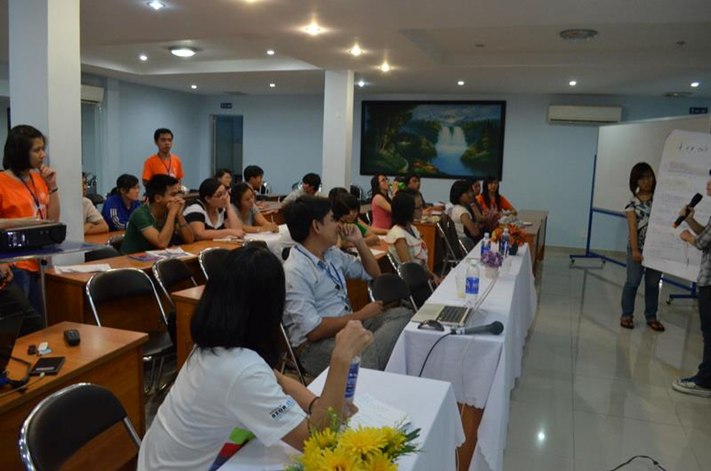 In August 2012, around 70 Vietnamese students attended our “Service Learning in Vietnam” workshop , from which, they were introduced to Service Learning case studies from schools in Singapore and America and run a mini Service Learning project themselves. This workshop was very beneficial for the participants as they learnt about the benefits of SL Projects in developing their talents to serve the community more effectively. It also allows EVG to build stronger connection with Hoa Sen University and start discussions about bringing SL into academic curriculum. 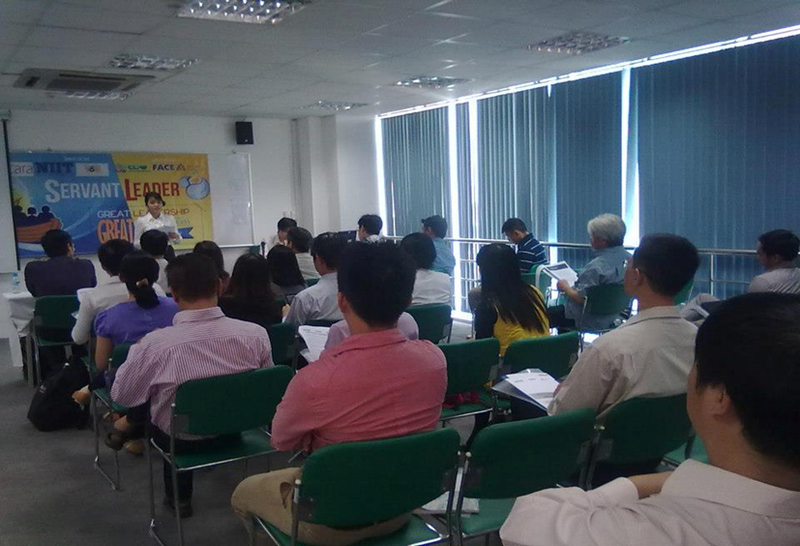 In December 2012, EVG closed this significant year by inviting a professional trainer and inspiring teacher from Saint Andrew’s Junior College, Singapore, Mr. Louis Ho, to held a three days training course for Hoa Sen University’s lecturers and 40 young Vietnamese leaders. This interactive and meaningful training is modelled from Youth Expedition Project (YEP) in Singapore. 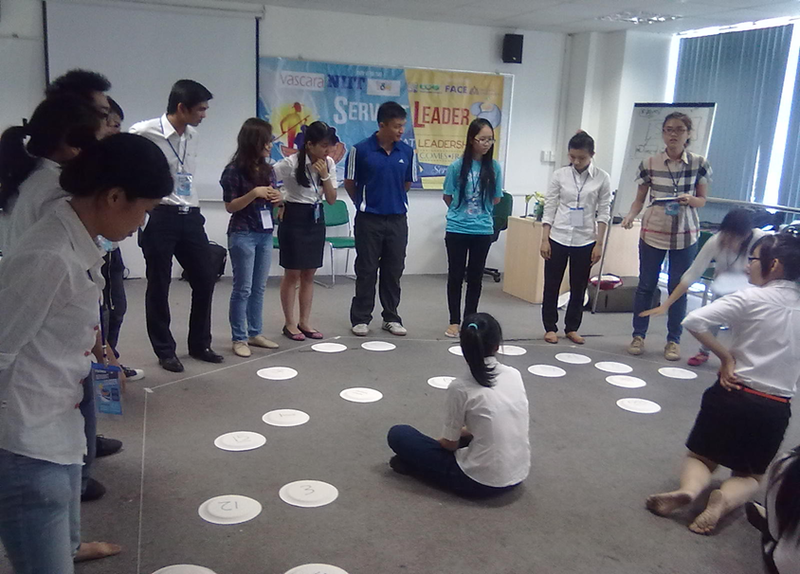 Participants in this course were prepared to be agents that will advocate the concept of Service Learning in Vietnam. From Mr. Louis Ho’s wisdom and passion, these youth were set on fire to arrange and lead SL Projects with deep understanding of the benefits to the society. EVG is working closely with Hoa Sen University’s Faculty of Languages and Cultural Studies to infuse SL into the academic curriculum. Lecturers in Hoa Sen University are extremely interested in the concept of SL and understand the importance of emphasizing SL Projects in developing a holistic education for their students. EVG also desires that more universities and schools in Vietnam can understand the importance of SL and work together with EVG to introduce SL into academic curriculum to nurture holistic future generations.